I took the summer off and had a lot of fun outside. I posted some photographs that I have taken of my adventures. I’m no longer in full hedonist mode, I’ve decided to work with United Front Games. By skateboard it takes 26 minutes to get there, longer if the number of pedestrian collisions is above normal. I also published some code under the GPL. I donated the SID filter from Atlantis to Jan-Marco Edelmann for use in his Blitz synthesizer for Psycle. He’s refactored it and made it more readable- at the cost of comments, a fixed samplerate and a per-sample switch statement implentation. It’s still a very simple algorithm, runs fast and has a great tone. Now every synthesizer on the planet will have my sound. I think that means I win. It looks like I missed something in the Atlantis 0.9g release. The pan shaper was not included. So- here it is. I got a tablet laptop recently, and I have to say, Atlantis is a treat with a stylus. And it even works in Vista. Goodbye mouse! I have a signifigant Atlantis audio quality update for you today. Hani didn’t like the clicking sound the routing engine was making in filters-per-voice mode. So, I fixed it. Now filters in filters-per-voice mode are always running, just like the global filter. You may notice a slightly different decay sound- this is the filter running. Before it would stop running when the envelope decayed, and any resonance would be cut (click) and continue on the next note (click). This will consume more CPU power in polyphonic mode, so be sure to turn the number of voices down to the lowest useable level that you can get away with, or disable filters-per-voice mode entirely. You can adjust these settings in the config dialog. I also optimized the monophonic and arpeggio modes, so they will recieve a performance upgrade in this release. I’ve got a little Atlantis update for you. This version allows you to use MIDI learn to assign bend and velocity modulators. Now it’s even easier to go crazy. I’ve also updated the Atlantis Manual pdf. Guess what? I’ve got a new build of Atlantis. It’s got some new features, and maybe even some new bugs for you guys to find. The Repeatverb and Destroyverb are nasty little reverberation algorithms that are based on something I wrote for Jim Redfern to use in one of those demo competitions where you make your program crazy small. Use them to add some wet depth and weirdness. They do use a fair amount of CPU, so I suggest turning Filters-Per-Voice mode off in Atlantis if you are using it with the synthesizer. I also suggest sticking a lowpass filter behind them. 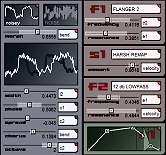 The Pan module is something that Yann suggested and is everything you would expect from a serious panning algorithm. It uses a sine-law, if you care. Thanks to Rajko and Hani for reporting and testing the waveform save bugs. Wow… Here is a new Atlantis update! A folder in My Documents\ called Atlantis\ will be created once you run the new version. You should probably move all the crap from your legacy c:\chips folder into it. You can change the location of this folder in the Config panel if you chose, even change it back to c:\chips if you are too lazy to move your stuff. It’s been a while since I have given an update. Once snowboard season is over, I will have a few more cycles to dedicate to Atlantis. In the Atlantis Manual I have a wish-list in the future section. Most of these are GUI and file related. This means that the synth engine has matured to a level that I am happy with. Not sure why I never mentioned this here before. Ages ago, I made the File Deleter v2 plugin for Winamp. I still get emails from excited users on a regular basis. Most requested feature: hotkeys. I have not worked on this in years, but it’s great to hear from people that enjoy it.